Is the moment of innovation more exciting than the period of enjoyment thereafter? What happens when zeitgeist changes and context fades? Although I am old enough to have eaten at Jamin, Joël Robuchon’s first restaurant in Paris, I never did. And, even if I had, as a toddler, I wouldn’t have appreciated the revolutionary weight of his food, which, by all accounts was at the top of its time. Now, nearly thirty years later, Robuchon is father to a multi-nippled empire that spans the globe. I’ve been to his table five times: twice to his atelier in New York, once to his mansion in Las Vegas, and twice to the kitchen counter at the Hôtel Metropole in Monte-Carlo. And the cruel irony is that, with the passage of time and the changing of currents, I’m not sure I’ve gotten any closer to experiencing the excitement of Robuchon in his Jamin years (to be sure, it’s not the food at Jamin that I’m after). Because the Jamin years were the Jamin years, and they’ve passed, and the world has moved on. While that suspends Jamin, now closed and gone, in a magical place in culinary history, it has also haunted me for years. Having been uninspired by my meals at both the atelier and The Mansion, I was caught in one of those helpless, “it’s not you, it’s me” scenarios. Did I miss the Robuchon boat? * Has my age forever barred me from experiencing and appreciating his food as it was when it was exciting and new? Is dining a state of mind? If so, could I alter mine to match? 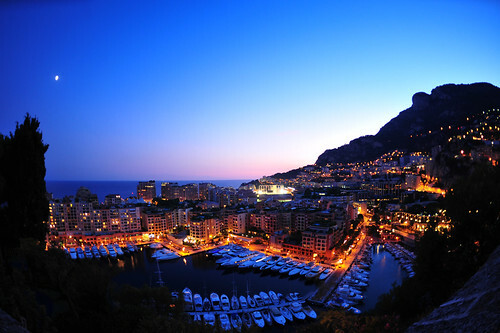 A week in Monte-Carlo gave me the opportunity I needed to reconsider Robuchon’s cooking. I went twice to his restaurant, book-ending my trip to the principality with a lunch the first day, and a dinner on the last night. If the Hôtel du Paris (home of Ducasse’s Louis XV) is the Boardwalk of Monaco, the Hôtel Metropole is Park Place. 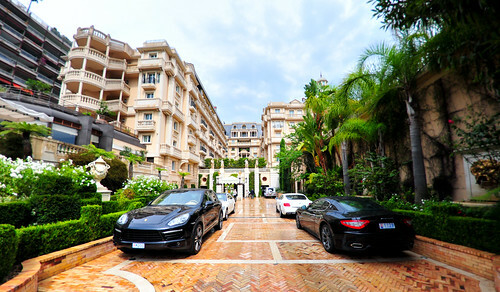 Set back from the winding drive that leads to the Monte-Carlo Casino, it holds court at the end of a narrow alleyway lined with luxury cars of all shapes and sizes, purposely positioned out front to advertise the hotel’s status to all who pass by. The menu is more akin to the ones you’ll find at his ateliers – a collection of inventive small plates with the option of a fleshier, more traditional main course. But it offers the trappings of his palaces – plush and upholstered, draped in tapestry; bread arrives on a cart (pain au lait! ), and so does a selection of classical desserts (an alternative to the ones on the menu, if they sound too abstract). 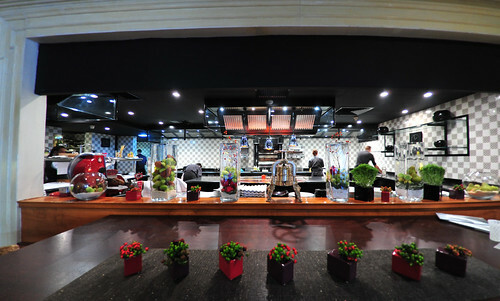 Although Joël Robuchon at the Metropole focuses on table service, it also offers limited seating at its kitchen counter, a large, communal hightop with a window onto the line. Given it’s amazing vantage, I don’t know why anyone would want to sit anywhere else. And yet, I found myself alone, twice parked on the threshold of this kitchen’s proscenium last September. Here’s what I’ve come to appreciate about Robuchon’s food as it is now: it’s concise. He distills for you the essence of a thought into each bite, every one complete, with nothing to spare. 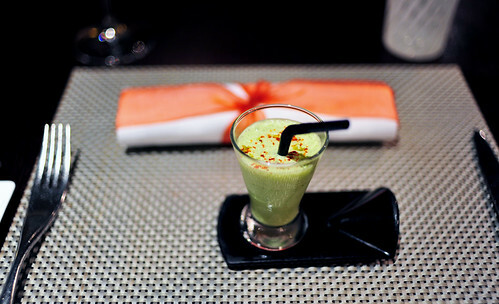 Take, for example, a cilantro “smoothie,” my amuse bouche at both meals. Spiked with chili peppers, it summed up the pleasing tension of the tropics in one foamy sip: spicy, but refreshing. He rendered Scandinavia on a plate of smoked herring, silky filets interleaved with waxy potatoes and bits of apple. It was elegant and accurate. And he abbreviated the flavors of the Mediterranean on a plate of octopus carpaccio. The skinned tentacles formed a chrysanthemum blossom, drizzled with fruity olive oil and dotted with sliced olives made to look like octopus suckers (see what I mean about being multi-nippled?). More tender octopus I have no not had, a more Mediterranean feel I could not want. But, is it enough to serve simple foods in fancy forms? What added value does Robuchon bring to otherwise ordinary dishes, common flavors? Why is potato purée – a particularly pappy version that I’ve never liked – his signature dish (from his Jamin years)? If it arrived looking like two quenelles of butter, it did not deceive – the ratio is roughly two pounds of spuds to one pound of fat. I still don’t get it. So, why, of all the other restaurants in the area that I could have visited, was I compelled to return to Robuchon’s table for a second meal? It certainly wasn’t for the service, which, though gracious, was a touch sloppy across the board. At dinner, for instance, I was served the same amuse bouche twice – by the same server. He realized his mistake, and passed it off as an extra gift from the kitchen. Lying will not charm your way to my heart. That particular server’s antics were entertaining, if not slightly unprofessional. And, it certainly wasn’t to save a dime. This food ain’t cheap. But the cooking is unusually precise. And the ingredient quality, for the most part, exceptional. Coupled with efficiency of flavor, this is why I returned. The veal kidneys I had at lunch were plump and tender, their texture almost indistinguishable from the sweetbreads and roasted chanterelles that came with them. There was a bit of meat jus, which was perfect, really. And some parsley. Simple, but flawless, it was balanced and neat, showcasing the flavor of the kidneys confidently. That’s a rare thing. Robuchon likes spice – specifically espelette – and so do I. 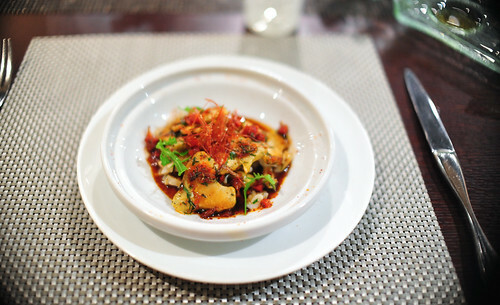 He used it to enliven confetti of crab meat and vegetables wrapped in tissue-thin daikon, beautiful spring rolls upended tall as “giraffes.” And he used the peppers to punch up a tagine of purple artichokes with curls of baby squid. The flavor was surprisingly dark and rich. Served piping hot, it was my favorite of the lot. Green peas, served with a coddled egg and crispy pata negra ham, alone, were disappointing, an illustration of the hazards of using exceptional ingredients. They were flavorless, wrinkled and mushy. Against the other baby vegetables in that dish – all of which were spectacular, both in flavor and texture (they must have all been cooked separately to achieve those textures) – they stood out. I even asked my captain about those peas (but only after he asked me what I thought of the dish). He insisted that they were freshly picked. I didn’t doubt him. But they needed to go pea picking elsewhere. Maybe I returned for the desserts, too. I’ve always loved the ones at Robuchon’s restaurants. At lunch, I had an unforgettable “Fairytale,” a fragrant meeting of vanilla, Champagne, and peaches, all under a crisp meringue dome. It was one of the best desserts I had last year. 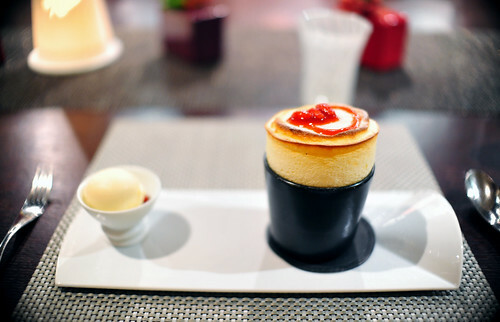 At dinner, a perfect soufflé, with raspberries, and a side of yuzu ice cream. There really isn’t anything else I can tell you about this dessert that you haven’t already imagined. If the Jamin years was a state of mind, then I’m not sure I got any closer to achieving it in Monte-Carlo. Even though I enjoyed these two meals at the Metropole more than my previous Robuchon experiences, neither one excited me the way that other restaurants, both contemporary and passed, have. Have I cursed Robuchon with unfair expectations? It’s not him, is it? It’s me. Maybe I did miss the Robuchon boat, and now must settle for borrowing time to understand the past in the present. Or, maybe, I’m making a mountain out of a mole hill, trying to resurrect the dead instead of celebrating the living. Maybe, just being able to appreciate Robuchon’s food, as it is now, beyond a simple “like”/”dislike” model is reward enough, an informed experience that somehow manages to escape a seemingly inescapable cost evaluation. I managed to at least achieve that. Isn’t that enough? You’ll find photos from my lunch here, and photos from my dinner here. * The same is true for David Bouley. I don’t deny his claim to culinary genius, but after three disappointing meals at his restaurant, I fear I’ll never experience it. ** The blingy shopping mall underneath the Hôtel Metropole is also home to Monte-Carlo’s Ladurée. *** And because of this, it’s probably the most “normal” Robuchon outfit I’ve seen. Yet, having only dined at either end of the Robuchon spectrum, this middle seemed a strange creature at first. ~ by ulterior epicure on April 4, 2012.